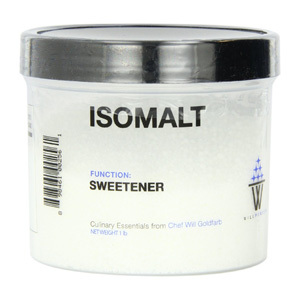 Isomalt is a sugar substitute with very similar properties to sugar but with half the calories. It is a sugar alcohol composed of glucose and mannitol and is produced naturally by beets. In cooking it can be used instead of sugar in a 1:1 ratio, but may produce unpleasant gastro experiences in large amounts (>50g per day). Isomalt is regularly used in sugar pulling and casting as it has a higher tolerance for humidity and stays flexible longer than regular sugar. Additionally, it doesn’t crystallize like sugar making it perfect for candies. This ingredient is used in my variations on apple and carbonated cranberries.